I haven’t had this much fun in a long time. What a great event! 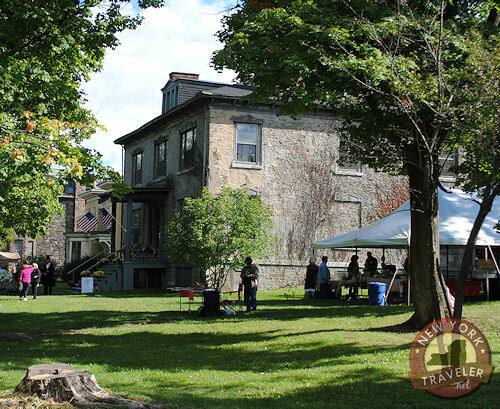 We attended the 2nd Annual “History Comes Alive!” in Rutger Park, presented by the Landmarks Society of Greater Utica. 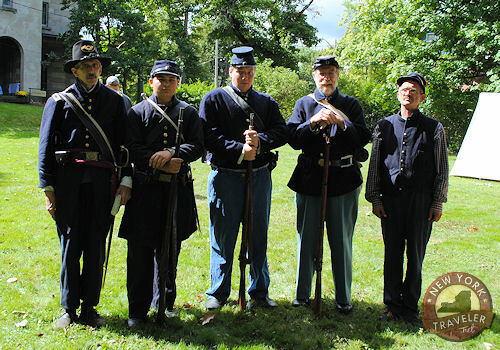 The event was based on the Civil War, as this year is its 150th anniversary. I intended to spend only an hour or two but we left (reluctantly) four hours later! Everyone was so friendly and talkative! These folks are very passionate about the history they represent. Many of these “actors” come from all over the state to participate in various events like these. 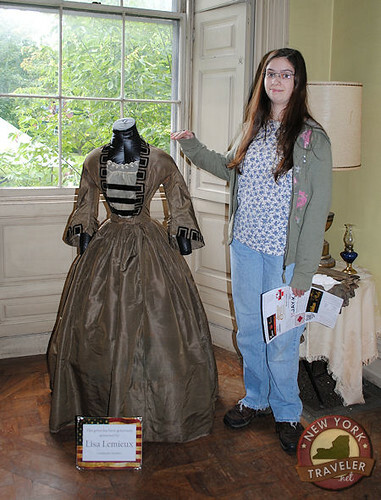 They research their chosen characters, create a costume, and educate visitors like me all about their character and the times. I chatted with beautiful Daphne Stowe who played the part of Flora Remington, Samuel Remington’s wife. Her conversation was peppered with the remarkable exploits of these people of past. She was very thoughtful as she contemplated the horrors of war and how life was back then. 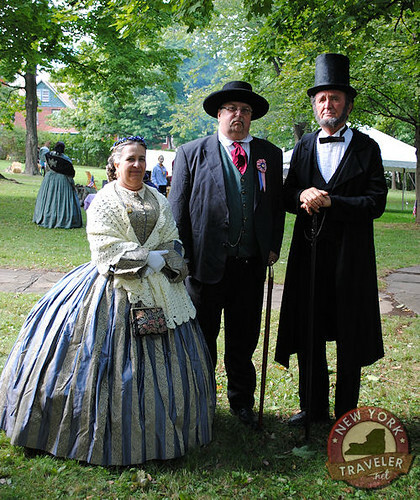 We talked for a while with Captain Stephen Litzenberger who represented the 157th New York State Volunteers Regiment. This regiment combined the forces of Cortland and Madison Counties during the Civil War. Mr. Litzenberger discussed the volunteer work that goes on behind the scenes for these types of events — a lot of travel but what a wonderful experience! 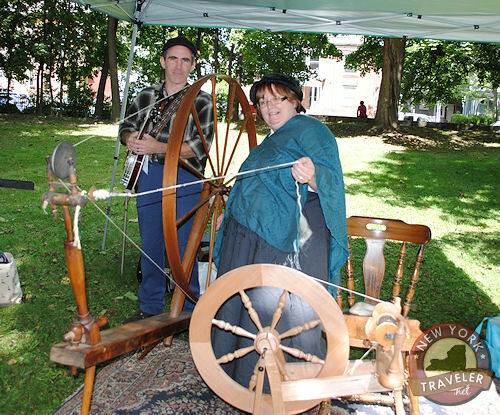 We watched a demonstration of old-fashioned spinning on the spinning wheel. It’s hard to imagine our forebears spending all that time raising sheep (and flax), carding the material, spinning it and making clothing! Today, homespun textile work is an art form. Our pal Abraham Lincoln (played by Jack Bayliss) was here, with his gracious wife Mary Todd Lincoln (Judee Synakowsi) and bodyguard Ward Hill Leman (Leo Synakowski). They were full of stories! I especially liked “Mr. Lincoln’s” narrative of meeting Sarah Palin last year at the 150th anniversary event at the William Seward Home in Auburn, NY. He said she is a wonderful woman. The Secret Service had to pull him away because they had been talking too long together! You don’t often heard about Ward Hill Lamen. He was a U.S. Marshal, a sympathizer of the slave laws and of the exact opposite opinion of Lincoln on the subject of slavery. Yet, Leman was Lincoln’s bodyguard. Unfortunately, he was not with Lincoln that fateful April evening at the theatre. Before he left town, he warned Lincoln not to go out. How would history be different if Lincoln had listened? “Mr. Leman” told us an interesting fact about that April night, too — at the time, Washington, DC, had a law that forbade an armed, standing army in the city. Therefore, Lincoln’s guards were unarmed. Who had the gun? Why, the criminal, John Wilkes Booth! 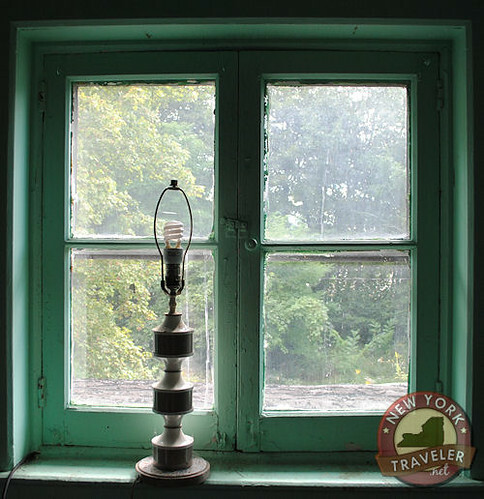 I also learned so much about the Landmarks Society of Greater Utica. Previously, I had only cursory knowledge, had heard that the organization had saved some dilapidated historic landmarks on Rutger Street. As I spoke with some of the people involved — especially the young people like Chris and NikKi (did I get your names right?) — I became more and more interested in their mission. Their enthusiasm is incredibly contagious! I am seriously thinking about joining the cause. 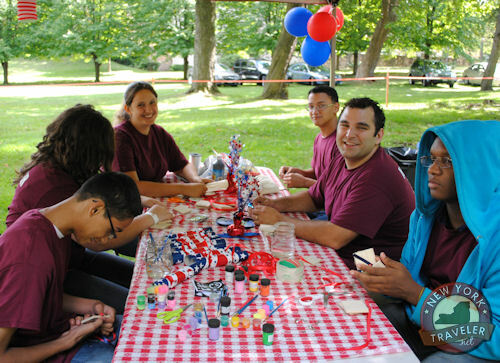 Here are some of the volunteers for the Landmarks Society, preparing crafts for children. 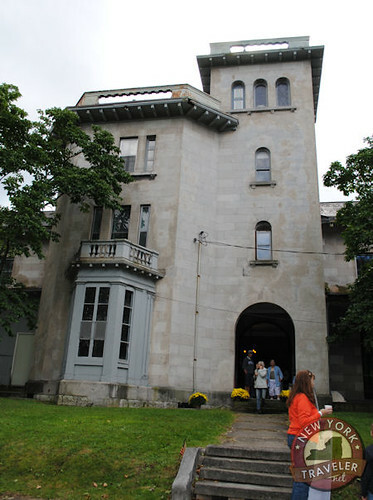 The Landmarks Society opened up a few rooms in their two purchased mansions — the Munn home and the Conkling home — for public viewing. This is the Munn home and it was very imposing. The Remingtom family had lived here for a time during the Civil War. Later, it was converted into a nursing home. This is the Roscoe Conkling home where he lived here with his wife Julia Seymour Conkling. 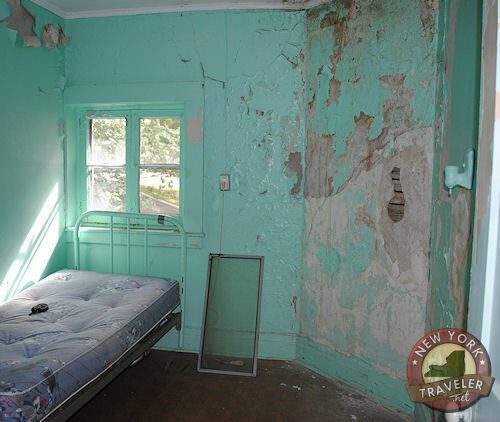 This house is in terrible shape, as well, but it beneath the crumbling plaster is a jewel. The home was once so beautiful. Sunlight streams in through the large windows — what a lovely home. Ball gowns of the era were on display inside. I can’t believe how tiny the women (and men) once were! 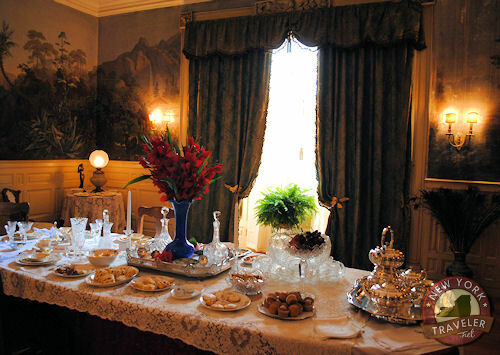 Tea was served — 1800s style — in the dining room by Fiona O’Downey. The setting was exquisite! 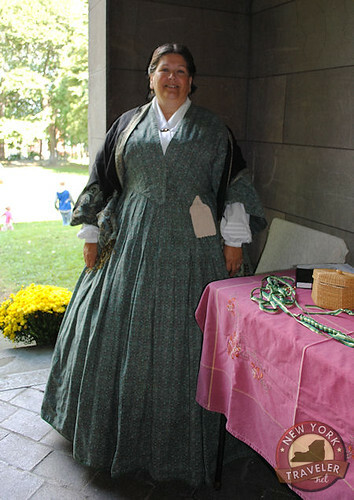 Unfortunately, I missed the reenactment of Julia Seymour Conkling signing the charter for the Oneida County DAR. Both houses are in terrible disrepair. They need new roofs to stop the leaks. The Landmarks Society is hoping for a grant from the state to help — I hope they get it. I will have much more on the condition of the homes and the mission of the Landmarks Society in future posts. This is a worthy cause and I heartily recommend that you support it. Utica has many wealthy philanthropists in the city — why can’t they help? I hope they do. It was a spectacular event. All proceeds went to the Landmarks Society. There was a good, steady crowd but I wish it had been busier. I think as word gets out about this little group trying so passionately to restore a great city, they will get more support. I for one am going to do it! I would like to especially thank Chris and Nikki and Karen Day for the opportunity to participate in this event. Chris and Nikki took quite a bit of time with me, showing me the houses and giving me their “extended tour.” It meant a lot to me, and I am even more determined to exhort others to support this cause.